Meet The Koalas! This pocket-sized card pack features a dandy bunch of fuzzy gum-leaf chewers, each of whom expresses a different emotion: proud, curious, scared, friendly… you pick the words! 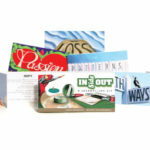 These cards are designed to help anyone name and identify feelings. For children and adults alike, finding the right words to describe feelings can be a real challenge; this is when the right picture can truly be worth a thousand words. While there are just 20 cards in this set, there are countless emotions and body signals being expressed through the images. It all depends on what you think each koala is feeling! Pick a card that sums up how you felt during the weekend. Which Koala is the closest to how you’re feeling now? Choose a card and tell a story about that Koala. Why is your Koala sad, happy, confused, curious or whatever? Have you ever been in a story like your Koala? Can you pick cards to show or evaluate how a project went? Did you change and become another Koala during the project? Which Koala do you think of most when you reflect on how things went? 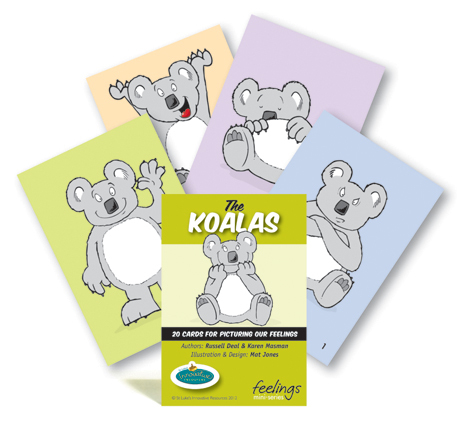 Turn the 20 Koalas cards over one at a time and name as many different feelings as you can for each card. This is a great way to build emotional vocabularies but also to demonstrate how we each show and interpret feelings differently. This mini card set is perfect for teachers, trainers, social workers, managers, counsellors … anyone, in fact, who needs a handy resource that can whipped out for spur-of-the-moment or planned activities. Over the years, many of you have requested a card set similar to our much-loved resource The Bears, but featuring a smaller number of cards. Here it is: The Koalas—part of the feelings mini-series! Most of the students at Arndell Anglican College (NSW) know Julie Nixon as their school counsellor. But what they mightn’t know is that there’s another, very different side to Julie’s life. Their unassuming school counsellor is also an intrepid humanitarian aid worker, who’s been regularly visiting hotspots in South East Asia for the past eight years. Just last year, Julie returned to this diverse, vibrant, yet sometimes hazardous part of the world. Working with the American aid agency Project AK-47, Julie has had the opportunity to see firsthand the impacts of political tensions and simmering military conflicts in the region. During October, she was in touch with colleagues who have been involved in the rescue of child soldiers. Over the past two decades, some 300,000 children aged between 4 and 16 have been forcibly drafted into armed groups in the region. Some of the lucky few to be rescued now live in children’s homes where staff address their physical, educational and emotional needs, and support the children’s recovery from trauma. Based at a farm that produces dairy products and cheeses, Julie, officially, was on the ground to advise on local agricultural techniques. Unofficially, her role was to train the leaders of nearby children’s homes in child development and trauma management. Many of the children in the homes present trauma-related issues such as bedwetting, anger, fidgeting and anxiety. As Julie explains, the question she faces with the home leaders is ‘What does normal look like?’ for children brutalised by captivity and combat. Making matters more complex, staff in the homes often battle with instability and difficulties in their own lives. Julie observes that many have poor problem-solving skills and struggle to support each other in their efforts. In one exercise, Julie invited the staff to select cards from The Kangas to express their feelings about who they are and how they contribute to their communities. They were encouraged to identify their supporters and loved ones and reflect positively on what they bring to their relationships with others. After hearing about this deeply challenging aspect of her work, it came as a surprise to learn that Julie’s other volunteer activity was marriage counselling. I was slightly taken aback and asked Julie if divorce was out of the question for local people. It isn’t—but a number of couples were keen to work on their relationships by participating in a marriage group, just like plenty of couples in western societies. Working through a translator, Julie invited the couples to place objects representing their marriage on a piece of blue paper—an adaption of the classic sandtray therapy exercise. The objects chosen by one pair were potently symbolic: a striking cobra, a knight and a tiger to represent the moments when the relationship deteriorated into verbal and physical violence. Julie also produced The Kangas to help the couples express how they felt about their relationships. No words were needed to convey the frustration and sadness the couples felt. Later, during private counselling, one of the wives described herself as a woman reduced to a ‘screaming wreck’. As a westerner, and an Aussie at that, Julie was aware of being perceived as an unusually approachable person. People felt safe to disclose feelings and experiences to her that might otherwise have become the stuff of local gossip. And being an Australian often earns her a warmer welcome than her American counterparts—when she visited Sri Lanka in 2008, the rescued child soldiers were delighted when they discovered she could play cricket! Julie has found Innovative Resources’ card sets ideal for cutting across language barriers. Interestingly, she also prefers to work with the two new mini-sets, The Kangas and The Koalas, rather than larger card sets like The Bears, Koala Company and Stones …have feelings too! The mini-sets were ‘incredibly useful’ for her work with couples and the children’s homes leaders. Even allowing for translation difficulties, many of the people she encountered struggled to articulate feelings and only had a very basic emotional vocabulary to draw on. The mini-sets offered a less complex range of emotions for people to choose from—and since they’re no bigger than playing cards, they’re perfectly small and light to carry! As Julie acknowledges, her work is as much concerned with teaching emotional literacy as it is with providing training or helping others confront personal challenges. ‘The cards have been a gift in helping,’ she affirms. And invariably they are snapped up by local people or her co-workers long before she packs her bags to come home!